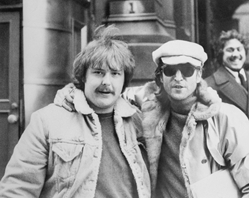 Paul Goresh, who got only picture of John Lennon with his killer hours before the Beatle was shot, has died. Beatles Radio: The Beatles, Solos, Covers, Birthdays, News The Fab 4 and More! Paul Goresh, who famously snapped the only photo of John Lennon with his killer — one of the last pictures of the legendary Beatle — has died. He was 58. Goresh, from North Arlington, N.J., had been sick for some time, his cousin Rosanne Taylor wrote on a John Lennon Facebook fan page that he maintained. She confirmed his death to the Daily News on the phone Tuesday. Goresh died Jan. 9, she said. “It is with much sadness and a heavy heart that I need to let you know of Paul’s passing. Paul had been sick for awhile . . . We spoke every few days and he was touched by the outpouring of love and good wishes that were sent to him,” she wrote. “Every one of you touched his life in a unique and special way, and he wanted me to let you know that that meant the world to him,” she added. Taylor said Goresh had requested that no service be held for his death and the family is honoring his wishes. “Everyone knows his love of The Beatles and especially John Lennon. I hope they are together and happy now,” she wrote. Goresh was forever haunted by the photo he took on Dec. 8, 1980 outside the Dakota apartment building at Central Park West and 72nd St. on the Upper West Side.